You must be a member of the Turin Outdoor & Sports Group to attend this activity. Would you like to join this group? A pleasant walk free of dangers suitable for all ages that will lead you to the ideal place for watching of the wonderful mountains and where the appetite won't be lacking. About Casa Canada: Constructed from John Johnson's Sitka Log Homes in Canadian pine by using coniferous trees, the structure has a huge cedar trunk in the middle, found by Johnson along ocean beaches. 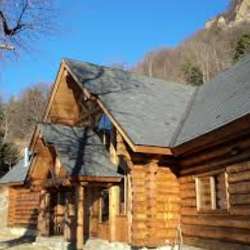 No plant, to underline the eco-sustainability of the project and the attention of Canada to environmental resources, has been specially cut to realize the log-house. The construction material, stored in 22 containers at a constant temperature, was transported from Canada to Italy by ship. The intention of the British Columbia was to make it - what it was during Turin Protected content meeting point between Italian and Canadian companies as well as a stage for the diffusion and promotion of the province and Canada as the venue for the following winter games. At the end of the Protected content , British Columbia donated the structure to the city of Turin, which in turn donated it to the Mountain Community Pinerolose. We will have lunch at Casa Canada or at your choice you can bring your packed lunch.